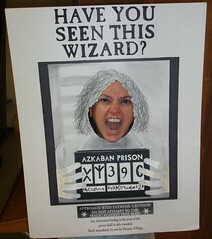 The Harry Potter Fest 2011 was fantastic, all eleven hours of it! Travis Prinzi was a brilliant guest, Hawthorn and Holly gave a fabulous concert, and of the twelve teams that competed in the trivia contest, those who won first and second place were made of students from my seminar! Well done, everyone! We enjoyed owls and quidditch and lots of Hogwartsian food and drink, as well. You can see my pictures here. This seemed Halloween-appropriate. You always knew I was a bit "off," didn't you? Text of the Day: Today's short story is "The Music on the Hill" by Saki (1870-1916 ). Congrats on your students cleaning up the trivia. Way to mold the minds of tomorrow! Also, thanks for the virtual gift. Yay Halloween weekend! And you're most welcome! Three cheers for Halloween! Congratulations on the successful Harry Potter Fest! You are my favorite Prisoner of Azkaban!! Congrats also to your students winning the trivia contest. They have a great professor :) Love the pictures...the owls are amazing. Looks like a wonderful time for all. Aw, thank you so much! :) It was indeed a wonderful time. And the owls were incredible! Aw, that makes me smile! 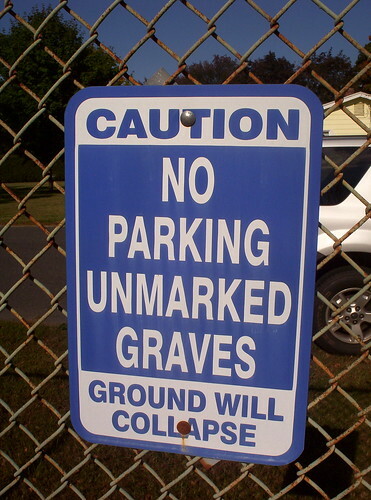 It's a truly shiver-inducing sign. I love the matter-of-factness of it. I love that photo so much. That sign is great! It makes me think of when we went to Ratoo Tower in Ireland - The graveyard was *awsome* but I was terrified to try and walk around in it as the place was so overgrown, you couldn't actually tell where the decrepit old tombs were exactly and I was afraid I'd step down and... ACK! I have fallen into a musty old grave and can't get out!! !